With Valentine’s Day just around the corner I have been busily looking for a sweet gift for my Valentine. If you are like me, it takes some time to think of the perfect “man-friendly” (but still sentimental) gift for this day. I have baked cakes and cupcakes in the past, but wanted to try something different this year. When I saw a recipe for mini cheesecakes I knew I had a winner! 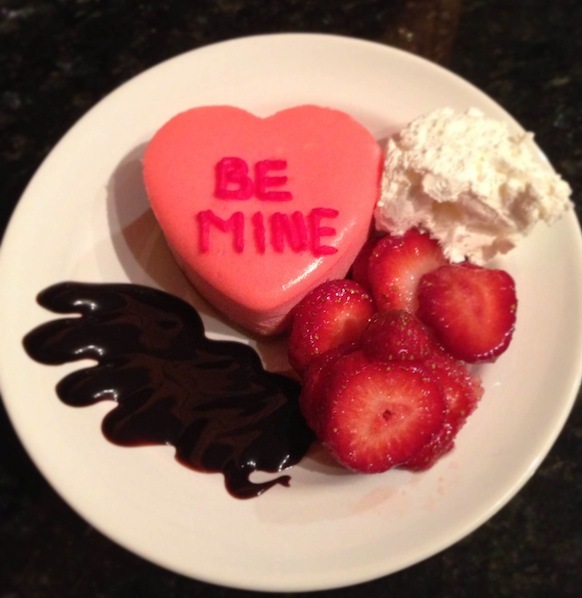 I had never attempted to make a homemade cheesecake, so I made it my Valentine’s Day Pretty Little Pastime. Place the wire rack into your roasting pan with empty heart silicone molds on top. Fill the pan with enough water to go 3/4 of the way up the sides of the molds. This will act as your water bath during baking. Remove the wire rack and heart molds and place the water-filled roasting pan in the oven. Preheat your oven to 325 degrees with the pan inside. To make the crusts of your mini cheesecakes combine the graham cracker crumbs, melted butter, and cinnamon. Mix together until well combined. Fill each heart cavity with about a tablespoon of the graham cracker mixture. Press down on the crumbs firmly to make an event crust. Place the molds into the refrigerator until you are ready to fill them with the cheesecake mixture. Beat the softened cream cheese on medium-high speed until smooth. You will want to make sure to scrape down the sides of the bowl and mixing blades to avoid lumps. Once smooth, add sugar and beat for one minute. Add eggs and beat for 1-2 minutes until creamy. Add the sour cream and vanilla and mix to combine. Equally divide the cheesecake filling into six bowls (clear works best so you can see the colors well). Add your food coloring until you get the desired color. Remember that the colors will darken slightly as they set. I decided on pastel green, pink, yellow, orange, blue, and purple. When you cheesecake fillings are finished pour them into the heart shaped molds. 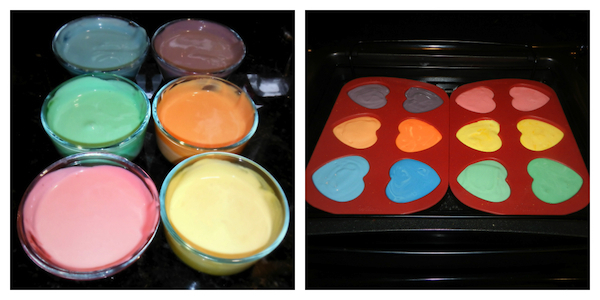 Fill the molds to the very top with each color. You should have two cakes in each color. Carefully place the silicone molds onto the wire rack and lower into the roasting pan. The water should rise to at least 1/2 of the side of the molds – if it does not, add boiling water to the pan. Bake for 25-30 minutes. You will know when they are finished with you tap the mold and they jiggle together as a solid piece. When the cakes are finished baking, carefully remove them from the oven and let cool at room temperature for one hour. Before attempting to remove the cakes from the molds, set them in the freezer for at least 2 1/2 hours. Once frozen, you will be able to pop them out of the molds easily. 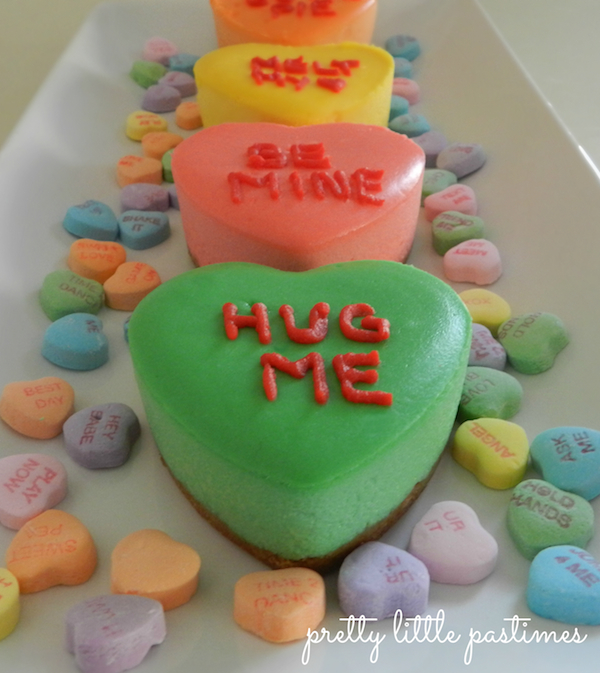 Once all of the cakes are out of the molds, take your decorating icing and pipe conversation heart sayings on each cake. Do not worry about making sure each is perfecting aligned – many conversation hearts are printed off center. I wrote sayings like: “xoxo”, “be mine”, “melt my heart” “cutie pie”, “true love”, and “hug me”. I also reserved one special cheesecake with our initials on it. Once the cakes are brought to room temperature they are ready to be served! If you are planning on making these ahead of time, they can be placed back into the refrigerator for a couple of days or the freezer for up to a month. If you want to freeze them, I would wait to decorate them, as the icing will change color when frozen and bleed into the cakes slightly. This simple cheesecake recipe is a keeper. Tonight I paired one of my mini cheesecakes with fresh strawberries and a chocolate drizzle. I can’t wait to try it with a raspberry coulis or blueberry compote next! These are going to make the perfect gift for my Sweet Valentine.